The annual ITS World Congress will open its doors on Monday 22 October 2012 in beautiful Vienna, Austria, and IRF will be part of it and launch its Manifesto on ITS. IRF is part of the high level EU ITS Advisory Group and will be representing your interest in this eminent panel during the autumn meeting and through participation in intermediary consultations. And we are joining up with ITS Arab to organise a dedicated ITS workshop on ITS deployment in the MENA region, during the IRF Regional Conference North-Africa & Mediterranean on 19& 20 March in Marrakech, Morocco. We are exited about these upcoming events and would like to extend a warm personal invitation to you to join IRF on these occasions. We hope you will enjoy this special IRF newsletter edition. The theme of this year's annual ITS World Congress, the 19th edition, is Smarter on the Way and the congress will focus on benefits of Intelligent Transport Systems to all traffic participants: how it can make transport safer, easier and cleaner. 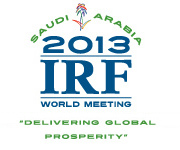 IRF supports this theme and will be actively present at the World Congress. In fact IRF will use the opportunity to launch its IRF Vienna Manifesto on ITS – Smart Transport Policies for Sustainable Mobility. 16.00-17.30hrs Special Interest Session 65: How to Sell ITS to Politicians? Organised by the IRF, this Special session will look into the key policy arguments to convince politicians and high level policy makers to buy into ITS. In 2008, the IRF established the IRF Policy Committee on Intelligent Transport Systems (ITS) to address the perceived lack of awareness with political leaders and key decision makers about the contribution ITS can make to achieve vital transport policy objectives. The ITS Policy Committee offers participants a high quality, truly global platform for knowledge exchange on topics related to the policy and strategy context of ITS. IRF maintains strong ties with the International Working Group on ITS Benefits, Evaluation and Costs (IBEC) and supports its stance to promote the role of ITS evaluation in decision-making. IBEC is always present at the annual ITS World Congress with highly relevant and interesting sessions and a dedicated workshop to foster the role of evaluation. IRF installed its Policy Committee on ITS in 2008, because it was felt that despite a positive track record, ITS still suffered from a lack of both understanding and visibility among politicians, policy makers and the public at large. As a result ITS has not been fully integrated, if at all, in transport policies. Other upcoming IRF ITS events - Reserve the dates! 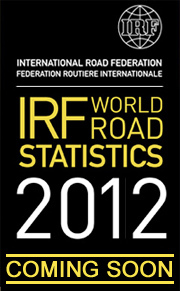 © Copyright International Road Federation 2012. All rights reserved.